Please refer to our stock # T 1735 when inquiring. 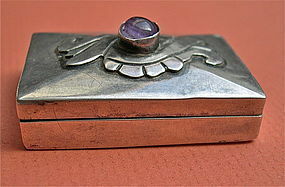 Pre Assay piano hinge silver pill or stamp box stamped and marked: Silver Made in Mexico. Applied ethnographic feather like design and a bezel set 7mm amethyst cab. 21 grams and could be higher than sterling. 1 1/8" X 1 3/4". While it has a nice vintage outer patina, the inside is very "white", as if when rec'd it was put away for decades and the inside never saw the light of day. Please collect with confidence after reviewing the dozens of Trocadero verified testimonials, then view all extreme close up images for more info, as all Qs will be answered here in lieu of email reply.